At Dreamydoodles Northwest all our breeding dogs live in our home as members of our family OR they live in the homes of some very special families called Guardians. The Guardian program was designed with the well being of breeding dogs in mind. In an effort for breeders to expand their breeding programs without having to house numerous dogs in kennels or outside dog runs, some very creative breeders started the Guardian Home program. The Guardian Home program allows breeders like ourselves to keep an active breeding program without raising dogs in kennels which is not even an option for us and this program also allows breeding dogs to live in FOREVER homes with a family..instead of being rehomed at the end of their breeding careers. A Dreamydoodle Guardian gets what we consider to be the very best of the best at no cost to the Guardian Family! We only add the highest quality puppies to our bloodline as breeders. 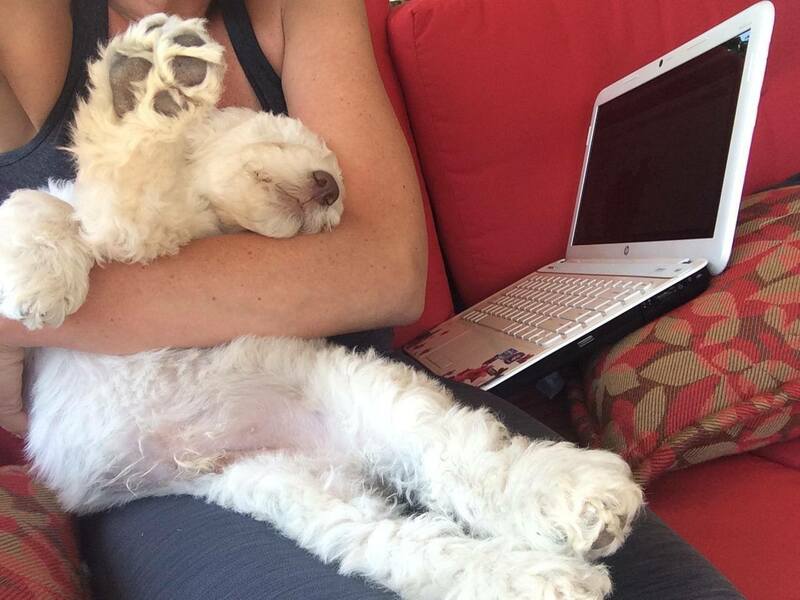 We look for the puppy who has all the best qualities our bloodline has to offer and that our families know, love, and have come to expect in a Dreamydoodles NW's dog. Exceptional beauty and brains, fantastic health and overall consistency in temperament. The Guardian gets to take part in the advancement of a bloodline which can be exciting and also very emotionally rewarding. Guardian dogs are raised just like you would raise and socialize any other puppy to adulthood with just a few extra precautions, for example keeping them away from unneutered males while they're in season. Once the female guardian comes into her second heat cycle, which happens between one and a half to two years old, Dreamydoodles would breed her to a stud of our choosing. Bred females stay with their guardian family during the 63 day pregnancy then about a week before their due date they come to stay with us to get situated and adjust to our family and routine before whelping their litter. We will be at their side to help them to whelp (give birth) and they will continue to stay with us as part of our family for 2 months to raise their puppies. We make sure they're given lots of affection, good nutrition, grooming and veterinary care while they're in our care. Each guardian dog contract is written different but we usually agree to a 1 to 3 litter contract. Once the contract is completed then they're retired from breeding and spayed at our expense and get to live out the rest of their long and healthy life with some pretty exciting stories to tell. Another great benefit to our Guardian Families is that their Guardian dog will be completely health tested for genetic issues as well as general health at our expense prior to breeding. Our Guardian Families get to enjoy the excitement of being part of our unique breeding program and seeing the offspring of their dog be placed with some really amazing families across the country, bringing others the same happiness that they've received from their Guardian Dog! Watching your Dog become a Mom, watching her puppies grow up and getting to hear the stories from their families and how much joy they've brought into their lives and sometimes completely changed their lives for the better.. that to me is the biggest benefit of all because there is nothing like the JOY that bring me personally. Maybe not everyone will "get it" but if you do then our guardian program might just be a great match for you and if you don't get it.. then probably not. This is not the "Get a "free" and expensive Dog Program"..this is a big emotional commitment. Please think it through before you apply. Hopefully, you've already read our Guardian Family information page and believe this is something you'd like to be part of .. if not then please read it first. Once you've read it then please fill out the Guardian Family application below..and we will be in touch with you when we have an opening for a new guardian family. I will only be in touch if we have an actual opening and I think you might be a good candidate. So, if you don't hear from me please don't think you've been denied or I am ignoring you and if you'd like to speak with me about this program or have questions then you can always email me at info@dreamydoodles.com. 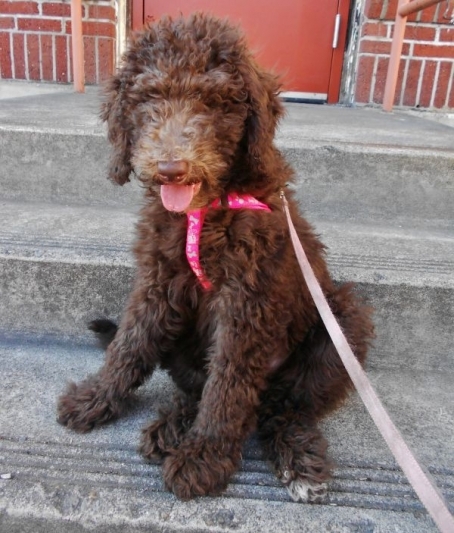 F1B Labradoodle "Maddie" as a Puppy. She's all grown up now and has had puppies of her own... including Arlo the puppy at the top of this page. Maddie's puppies are Multigen Labradoodle Puppies. Briefly describe your family and home life..
Do you currently have pets? Describe. Please list two personal references..
Have you read our Guardian Family Page? Do you have dog experiance? Willing and able to feed a premium dog food? Do you know how to detect a heat cycle? Agree to follow our Guardianship contract? Be willing to travel to us for breeding purposes? Do you agree to send us bi-annual photos?